He *can* stretch down and out. Finally. Finally finally finally. We had a really decent ride today, following a nice effort yesterday. Things are starting to come back together, and I’m relieved. When we started picking at my position a couple weeks ago, one of the things I was struggling with was getting Derby to move forward beyond a sluggish trot. Christy theorized that my closed hip angle was actually sending Derby “whoa” signals, even as I was asking for “go.” As we worked on my position, Derby started moving out when the situation up on his back improved. That was great but those moments were fleeting. The good news is that things are definitely better. Yesterday we had a very nice ride. Derby was a lot more forward and I worked hard on staying balanced, especially as I circle to the right, since I’ve noticed that I tend to collapse to the right, causing Derby to lean inward. I rode lots of patterns. paying attention to my balance, position and aids going left, and then maintaining those going to the right. The quality of Derby’s trot and our balance through the turns improved. This long German dressage term doesn’t have an exact English translation. It means looseness, but with suppleness, energy and throughness. It’s hard to describe in words, but I see it now when I watch Christy ride Remy, or when she lets Liam stretch after they’ve been working. The horses go forward with enthusiasm, but with balance. They are on Christy’s aids, and work beautifully over their backs. I want to do that. And today, we came close. With images of Christy’s recent beautiful rides on Remy fixed in my mind, I mounted up today, determined to build on my good ride yesterday. Right off the bat, I had a really nice, swingy walk. Derby was marching along with purpose and energy. After walking around on the buckle, I gathered up the reins and started to work on suppling. We flexed left, flexed right and did some shallow serpentines. The contact improved, at least it felt like it did, so I decided to check. Turning onto a long diagonal, I fed Derby some additional rein, and he stretched nicely. I sponged the outside rein, and pushed with my inside seatbone. He stretched a bit more. This was a real improvement. Circling right, I asked Derby to trot, and got a prompt response, and a decent trot. I repeated some of the suppling exercises we did at the walk. The contact improved even more, as did Derby’s trot. 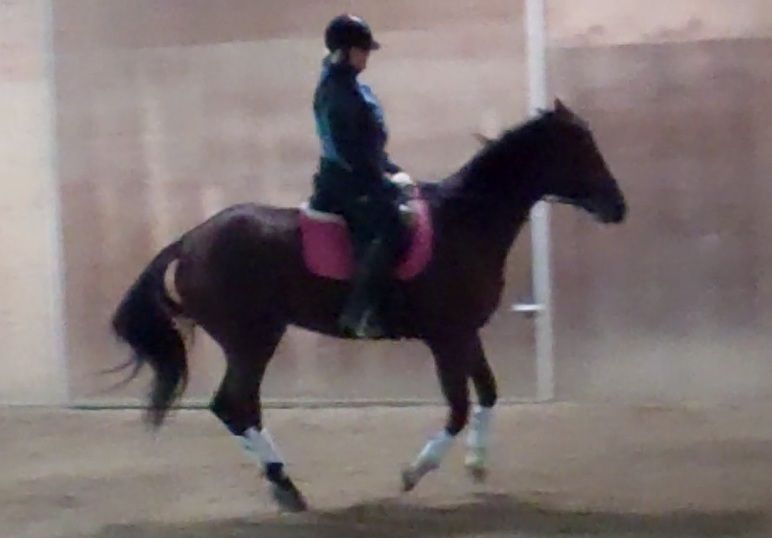 Taking advantage of the much-improved and steady contact, I decided to work on adjustablity within the trot. Heading into a turn on the short side, I half halted, and asked Derby to hold a smaller trot, and he did. Turning onto the long side, I kept the contact, and increased my my post. Derby responded hugely, stepping out into a really solid, forward, ground-covering trot, pushing from behind. I half halted into the next corner, and felt his back really come up. Down the next long side, his trot increased in power. For fun, we did some nice shoulder in, and Derby responded easily and willingly. I was thrilled. Around we went, changing directions, getting quality and power both ways. We repeated the shoulder in. Derby’s back was up, and it felt great. 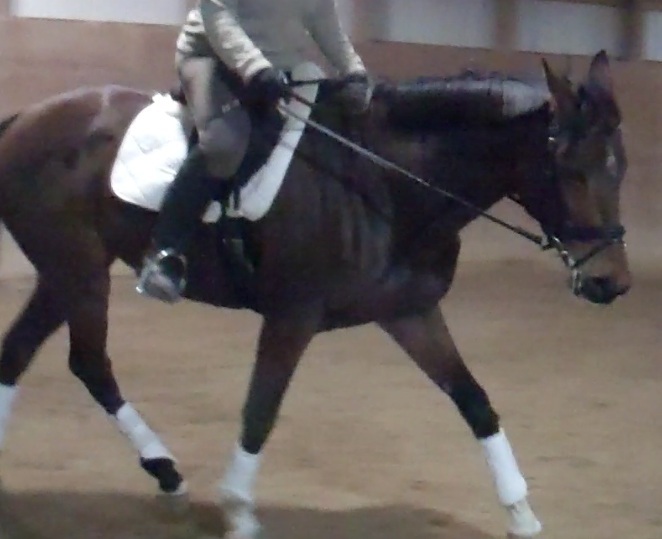 so I fed him a bit more rein produce a stretch as we trotted. I did dump him onto his forehand, but I sat up, half-halted, and we recovered. This was, by far, the best ride I’ve had on Derby to date. I think Christy really nailed it when she spotted the fact that my old position was blocking Derby’s forward gears. I’m excited for my lesson tomorrow night to show the boss what we’ve found! When my travel schedule ramped up in February, disrupting my riding routine with Maddie, she didn’t take it well. She became a challenge to for me handle, on the ground and – uncharacteristically – under saddle. Christy wondered aloud whether or not Mads was the good fit we had thought she was for the last few months. A couple weeks ago, things came to a head when Maddie was flat out naughty, and dumped me during a lesson. Unhurt but enraged, I got back on, and (I’m told) had the best ride of my life. However, it wasn’t fun, and afterward, Christy and I had a talk, ultimately agreeing that a horse that was better able to handle disruptions to the routine would be a better (and safer) option for me. Shortly thereafter, Christy was chatting with Maddie’s former owner, Cassie, and told her that Mads would soon be for sale. She forwarded some of the pictures and video you saw in the “Fancy Filly” post. Fortuitously, Cassie knew of a talented eventer looking for a good horse. She thought the two might click. A call was made, and Heather came to see Mads and give her a try. I was out of town and didn’t the two together, but I’m told that Heather rode Maddie absolutely beautifully. Some emails and phone calls between Christy and Heather ensued, and on Sunday, Maddie went home with Heather for good. Christy mentioned afterward that the two looked so good together that we’re probably going to regret selling Maddie. Fact is, I already do. I regret not being the confident and assertive rider that can get the most out of a horse like Maddie. That said, I don’t regret making the decision that I was overfaced, and admitting that I need a more sedate partner. The reactivity that makes Maddie potentially brilliant is just too much for me, and I don’t mind admitting it. I’ve seen people riding too much horse, and I’ve know women who suffered horrific injuries because they simply couldn’t safely ride the horses they owned. I’m grateful to Christy for watching out for me, and selflessly suggesting that it was time to sell the horse (I was the only one riding her.) It had to have been tempting to try to keep the mare – she’s wicked fancy and could have been a great addition to the show team – and to keep trying on us. In the short term, this might not look like a good business decision for Christy. However, she’s cemented my loyalty, and I’m hoping that a new pony that I can lease and ride arrives soon. Best of all Mads has a fantastic home. I think she’s going to love learning to jump, and I can’t wait to go see Heather and Maddie at a show. I’ll miss the big girl, to be sure, but I’m happy for Mads, and for Heather, who I suspect is thrilled to bits with her new mare. Things happen for a reason. This was one of the easiest horse sales ever – the planets were aligned. So, it leaves me looking at a few closed doors. I’m not sure what’s behind them, but we’ll find out soon enough! A step of leg yield! Notice how Maddie's inside hind is stepping inside the track of her inside fore. For tonight’s lesson, I asked Christy to pick up where we left off yesterday – I wanted to focus on continuing to hone the mare’s responsiveness. But first, we had to work through a pronounced reappearance of my bad habit of giving away one rein while hanging onto another. So first, we went back to steering with the outside rein, while giving with the inside rein – but giving by moving my arm forward, rather than letting the rein slip through my fingers. Christy had me imagine that I was holding a crop with my thumbs, and keeping my hands even, rather than letting one creep back near my hips. That trick worked well. So we moved onto lateral work. I’m happy to report that last night wasn’t a fluke! I put the mare to work, keeping off the rail and making deliberate turns, keeping her connected to the outside rein, and then yielding out on a circle. Once again, we had some nice moments, and the mare was pretty (though not perfectly) responsive. However, she was responsive enough, and I was a little jelly-legged after a mid-lesson bolting spook that I was able to somehow ride. This isn’t a pretty picture, but you can see that her back has come way up, and that she’s stepping inside with her right hind. We worked in both directions, and got some particularly nice work going left. Again, we started on a circle, and spiraled in and out, taking a step or two of leg yield as we spiraled away from the center. Mission to leg yield accomplished! I still need to work on her responsiveness – but I feel like we’re headed in the right direction after these rides. Progress is motivating! Cooks have a saying: the sharper the knife, the less you cry. Sharp knives are easier to handle and less dangerous than dull blades – they slice effortlessly through veggies and meat. A dull knife, on the other hand, is more dangerous, because it requires more effort of the user to achieve the desired effect. 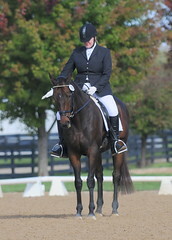 And like a sharp knife is easier to use, a responsive horse is easier to ride effectively. This saying came to mind tonight as I was leading Maddie back to the barn after a lesson, and grinning like a fool because it had been a good ride. I told Christy that I wanted to work on my lower leg aids, namely, my ability to use my spurs accurately. I had strapped them on last night for the first time in months, and some irritated behaviors from the mare told me that I had inadvertently banged her with them a couple times. While my leg position is much improved, I still revert to my old “toes out” posture when I get tired. Developing awareness and acuity with the spurs requires me to continue to improve my leg position and stability. So as I warmed up, I practiced deliberately putting my lower leg on, releasing, putting my spur on and releasing. However, as I did this I wasn’t getting much of a response from the mare. I was also having trouble dropping my heals and holding a good position – my hips were tight, and probably a bit tired from two strenuous rides yesterday, and my earlier ride today on Oliver. After promising Christy that I’d continue to work on my flexibility and strength, I took the spurs off. So the lesson changed course. 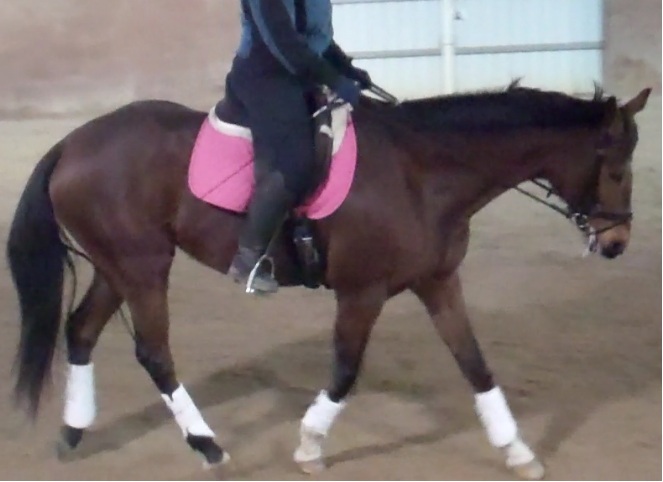 As we worked on my leg position and aids, which were partly successful some of the time, Christy told me that I was reverting to my bad habit of curling my heel upward, sticking it in the horse’s side and leaving it there. I focused on being more deliberate with my aids. However, I wasn’t getting the response I was seeking. Unsure of whether or not I was eliciting a response because I guess I forgot what a correct leg yield felt like, I asked Christy watch for response while I attempted to leg yield out on a circle. I got a big fat nothing. 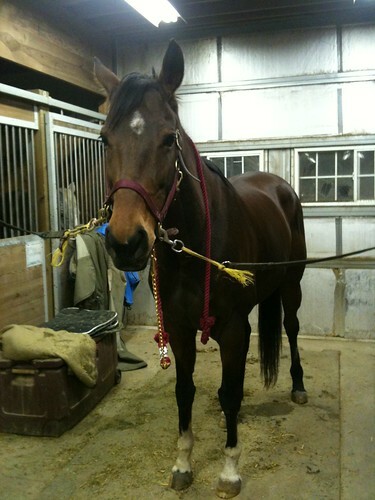 We talked about it a bit and I told Christy that I wanted the horse that I started riding last May. Mads was so light and sensitive then, and would respond instantly to any aid. And I’ve dulled her responses. So we started working on redeveloping a response, We started at the walk. Christy asked me to back up any requests I made of the horse with the whip, but advised me to treat any response – a head toss, a break to trot or canter, as good and to praise it, and to ride it. My first opportunity came quickly as Mads ignored me when I tightened my leg against her. I gave her a little whack with the whip and she hopped into a trot. “That’s fine,” Christy said, as I half-halted and brought Maddie back to a walk. We repeated this a few times, and within a few minutes, we produced a nice little leg yield down the quarter line! We continued on the circle at an energetic and connected trot. “You have her undivided attention now,” Christy said as we breezed around her. And she was right. The mare had one ear back on me, and was steady in the bridle. I asked for the leg yield again, and … Maddie floated outward. There it was! I was thrilled. We walked, and after a minute, I closed my legs softly on the mare’s sides. She struck off in a nice trot right on the spot. This was a seminal lesson,and an empowering one. I can fix my forwardness and responsiveness issues if I align my mental intent and my aids, and take care to reinforce my aids with whip or spurs if (and only if) necessary. I was amazed at the progress we made in one short ride. I can’t wait to get back in the saddle, and continue to hone and sharpen my aids, and Maddie’s responses. One thing I need to remember though is to stay consistent. To do otherwise is unfair to the horse. I need to ride every transition crisply, encouraging and rewarding prompt response, and reinforcing my aids clearly when needed. She's just so dang pretty. Christy was in between lessons and gave me a few minutes’ coaching, and with her encouragement, we got there – in both directions. And once I got the mare connected and over her back, following Christy’s instructions to leg yield out on the circle was surprisingly easy. I’m pushing her into the outside rein – and holding that contact – with an active inside leg. I’m driving her from behind, asking for more step. I am softening the inside rein. My posture is straight, my leg is long and draping, my shoulders are back – in other words, I’m sitting up and riding. 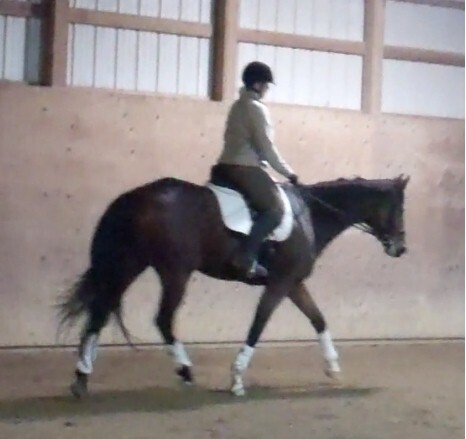 I’m inviting the bigger gait from my seat by posting further out of the saddle. I’m using half-halts actively to encourage roundness and engagement of the hind end. 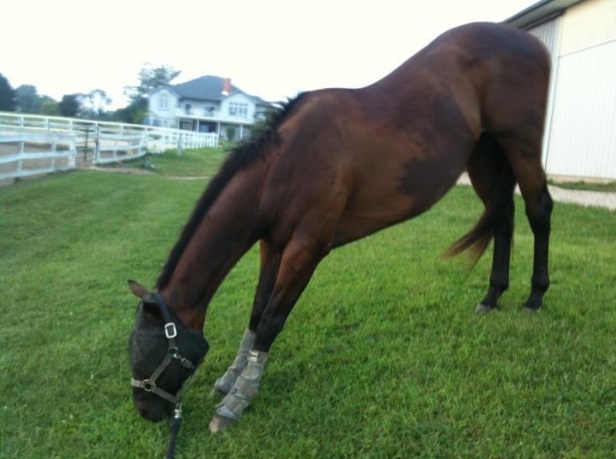 The contact is elastic – I’m holding it, but am also inviting the mare to go forward and maintain flexion. However, I also have to “catch” the power coming over her back in the contact, creating a loop of power, balance and contact in which the rider supports the horse and encourages an even better gait. What I’m beginning to understand is that this powerful, forward gait needs to be a constant state for us, not a fleeting occurance. I’m sure that the well-ridden dressage horse is always in this forward state of mind, encouraged by a rider able to generate the power and maintain necessary balance. This was a light bulb moment for me . This is what it means to truly ride forward. Over the next week or so I’ll be riding my friend Stephanie’s horse while she’s on vacation. 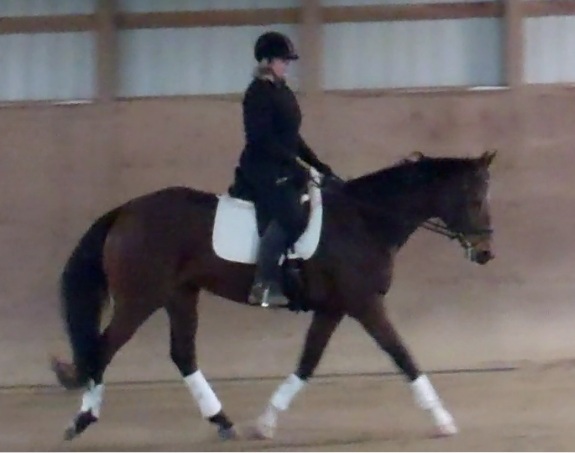 She blogs over at Dressage Adventures, and I’m recording my rides on Oliver there. I decided to capitalize on the time off by trying to erase the left-rein-hanging issues I’ve been having, hoping that the time off would also diminish learned responses from Maddie. So, I made a very focused effort to stay.off.that.left.rein while also not giving away the right rein. Going counterclockwise, I held that outside rein, kept my inside leg active, and made a point of giving the contact in the left rein continually. Mads was clearly appreciative, stretching very nicely into contact. I encouraged her, giving her rein and riding her in a lower frame (we both need to regain fitness), and we went around with nice contact, and more importantly, a marked lack of neck-bracing and rein-hanging. Toward the end of the ride, I was really able to get her moving, adjusting her gait with half-halts, and alternately asking her for bigger and smaller strides. Despite the time off, she did really well, bringing her back up and rounding very nicely. I do love how sensitive this mare is, and wow, she really takes a half-halt well. I’m looking forward to our ride tomorrow, and then am hoping to re-establish my routine this week, starting with a lesson on Monday. However, the weather doesn’t look like it’s going to cooperate fully – we have another stretch of hellaciously cold weather coming mid-week. My personal cut-off is 10 degrees – below that, I’m not interested in riding. But those cold nights are good for groundwork, so we’ll likely have some un-mounted work on Tuesday. The last few days have been illuminating, starting on Thursday. I didn’t ride on Thursday- work was catching up with me, and I had zero energy – so I gave my lesson to one of Christy’s other students, and she rode Maddie. It has been a long time since I’ve seen Mads go and it was fun to watch – and revealing. Mads went beautifully for H. and she didn’t hang on the left rein whatsoever. That provided more conclusive proof that the issues with the left rein are operator error – and not the big mare’s fault. So when I rode Saturday, I was resolved to practice what Christy had me work on during our most recent lesson – giving the left rein when bending or circling to the right, while being sure to hold that right (outside) rein. I worked at it – somewhat fruitlessly – giving the inside rein, while trying to keep my hands even and avoid letting the right rein get longer – but my efforts didn’t produce the quality bending I was hoping to generate. But then it happened. I caught myself shifting my right shoulder forward – effectively giving the right rein away. Eureka! So now I know what my next personal project is – fixing my shoulder alignment. A review of some recent videos provided additional confirmation. But at least I know what the underlying cause of my difficulties, so I can take aim at fixing the issue. Today Steph and I headed out to the barn early, to beat the rush because we both wanted to work on some things with minimal distractions. I wanted to work on making my transitions more crisp, and (of course) the rein balance info. We warmed up stretching and bending, and I really focused on keeping my right shoulder back, even with my left, rather than letting it creep forward. I did catch myself a couple times, but overall, I was pretty happy with the way things were going. I took my nice bending and started to work on transitions, shifting from walk to trot to walk again, asking for a prompt response from the mare, while also keeping her round. As we worked, I found I found I had a nicely forward horse and so I asked for the canter, and got a a decent upward transition. 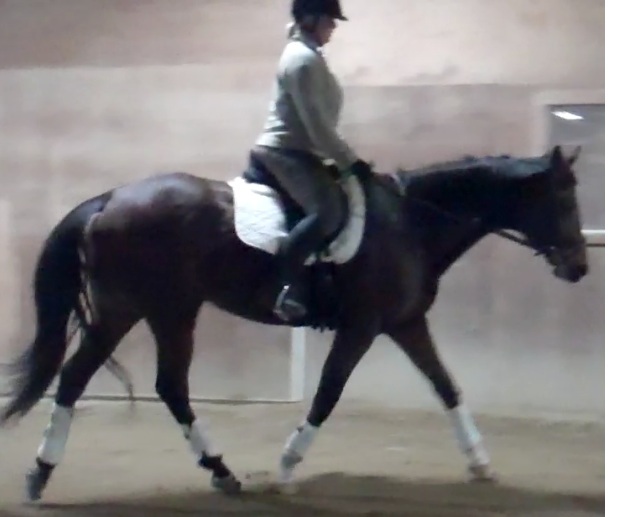 It’s easy to look good on Mads – she has the nicest, most rhythmic canter and it’s fun to ride. 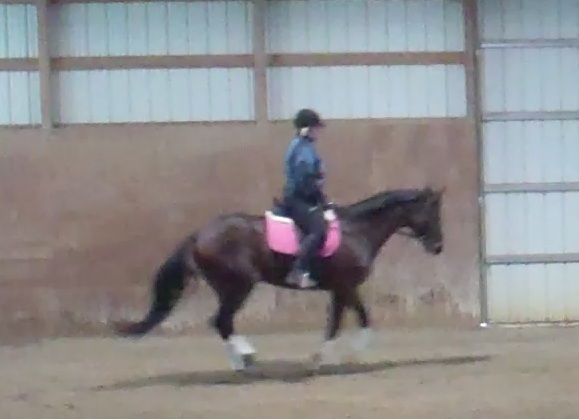 We haven’t worked much in this gait, and I need to work on swinging my hips, staying with (and influencing the gait.) That’s on the list of things to do. Mada has the nicest uphill canter. Now I just need to do a better job of riding it! 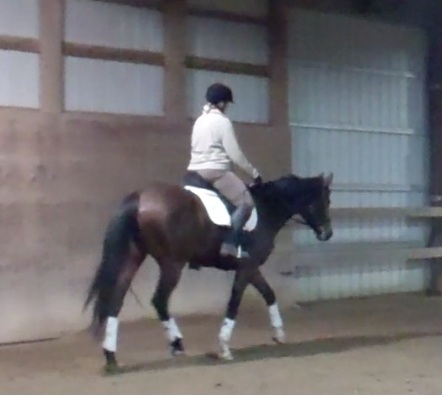 I was really happy with our short canter, and the downward transition was nice too. I kept her at a trot after that canter, mixing up the pattern, because Mads sometimes does start to anticipate the canter, taking it upon herself to offer it freely at every subsequent upward transition. So I redoubled the transitions, throwing in some halts, too. As much as she wanted to hop ahead, Mads was very responsive to the half halt, and I liked the quality of the little trot she gave me, though I did have to work hard with my core to hold her there. It was a satisfying ride, laying groundwork for the next set of skills I need to improve.